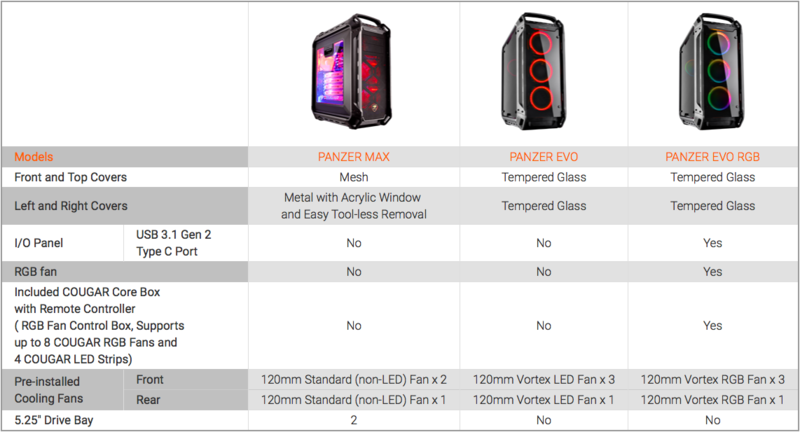 COUGAR is proud to announce the arrival of the last and most powerful iteration of its renowned Panzer Full Tower series: the Panzer EVO RGB. Combining four tempered glass covers, powerful RGB lighting and the industrial inspiration design that has characterized the series, this case offers massive amounts of space and unparalleled aesthetics. As its name indicates, RGB lighting is one of the strengths of this case. This is not limited to the four powerful Vortex RGB fans but also includes the COUGAR Core Box, capable of supporting up to 8 COUGAR RGB fans and four COUGAR RGB LED strips, as well as a driver-free remote controller. This allows users to start enjoying and customizing the more than 100 RGB lighting effects right out of the box, without going through any software installation or encountering compatibility issues. To make sure the included RGB fans, as well as any additional lighting the user might want to install, are fully visible, this case sports four tempered glass covers on its front, top, left and right. Special care has been taken to apply the exactly right amount of tinting to the tempered glass, achieving an ideal balance between an elegant dark look when no lighting is used, and clear visibility for all the RGB effects then the lights come on. This guarantees that the case will look great irrespective of whether the computer is on or off. No gaming case is complete without good cooling support. As usual, COUGAR has not skimped on this: support for four radiators (up to 360mm long behind the front and top covers) and up to eight fans allows users to create the perfect solution for each build, one that will enable them to prevent overheating and concentrate in enjoying their games. 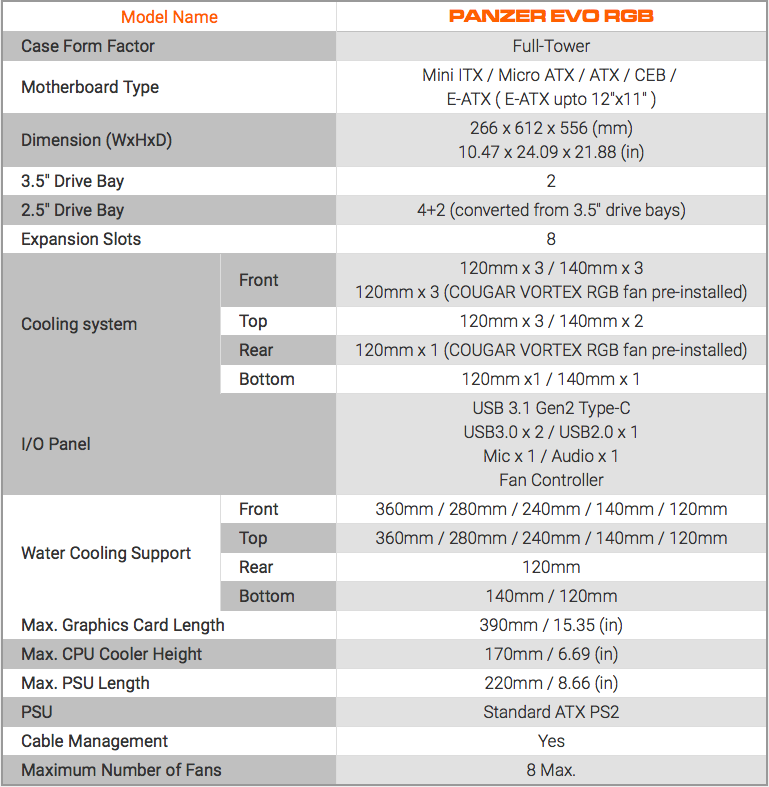 Panzer EVO will be available in the United States in June with an MSRP of 219 USD. For more details regarding availability in global markets, please check the Where to Buy section on the COUGAR website.